1. Mix up the book placement – try a mix of vertical and horizontal arrangements. Do this both within the same shelf and then also try mixing up the way entire shelves are arranged so that one shelf is all horizontal and another is all vertical. 2. Try arranging your books by color – This is often a bit controversial, but unless you have a collection of 2,500+ books, it shouldn’t make it any more difficult to find the books you’re looking for. This librarian is giving you permission to go for it. 3. Decorative objects – Think sculptural. A beautiful bowl, plate or even a stack of boxes. 4. Something natural – A lot of my favorite bookshelf incorporate organic materials. I have a bowl filled with rocks on my shelves, but you could also include a sea fan, a beautiful seashell or even an air plant. Image above: See all the photos of this creatively styled San Francisco home here. Image above: A mix of objects, books, books and magazine holders make this shelf visually interesting. See all the photos of this Boston apartment here. Image above: White books allow the objects to take center stage. See all the photos of this Chicago home here. Image above: Bookshelves don’t have to be just for books. Wire baskets keep anything unslightly tucked away. See all the photos of this San Diego home here. Image above: A bookcase doesn’t have to be sparse to look stylish. This shelf works because the books are placed at different orientations. Small objects placed in front of the books at visual interest. See all the photos of this Los Angeles home here. Image above: These shelves were created from wine crates nailed into the wall. The large size of the shelves make it perfect for displaying large objects amongst the books. See all the photos of this Los Angeles home here. Image above: Color arranged books in the dining room. See all the photos of this home in Washington DC here. Image above: Want to arrange your books by color? Go a step further and color-code your objects too. See all the photos from this Brooklyn home here. Image above: The dark color of the shelves sets off the natural objects displayed on this bookshelf. See all the photos of this Italian vacation home here. Image above: Face out your favorite covers. See all the photos of this Los Angeles home here. Arranging a bookshelf is always much harder than it looks! I just scored over 200 National Geographic magazines that I need to put on my bookshelves. I’ve got a bunch of NatGeos, too and yellow is not my favorite color. I split them up into groups, stacking them horizontal and vertically here and there, then balanced other parts of the room with sunflowers. I have to arrange my new bookshelf today! Thanks for the perfectly timed post. I’m a recovering English major and will be collectin forever. And I definitely believe that bookshelves should be beautiful as well as functional! I love small vignettes on bookshelves, and I think my friend Katie really nailed it too with her built-ins – link as my name, if anyone is interested in her vintage trophy and miniature dog collections :). She nailed the bookcase! I love it and it is exactly what I was looking for. It will be my project for today. Thanks for posting it. I am losing my mind over that gold penguin on the wine crate shelves…but the link is incorrect for the full feature! Help! The best way to “style” a bookshelf is to fill it with books you love. I KNOW all these tricks, but needed the reminder as I have been bored with mine for a while now. I use nice-looking books magazine-rack style to hide the stacks behind them, creating a visual divider at the entrance to my bedroom, but I’m tired of it looking like a bookstore. BTW-to Jennifer–Fabulous job on those huge built-in bookshelves of yours! Wow! The wine crate/LA home link isn’t working, it’s linking to the DC home. Any way to fix that? Thanks! I love well-decorated and arranged bookcases. This is on my to-do list of new home projects. Beautiful. Just the inspiration I needed to work on mine again! 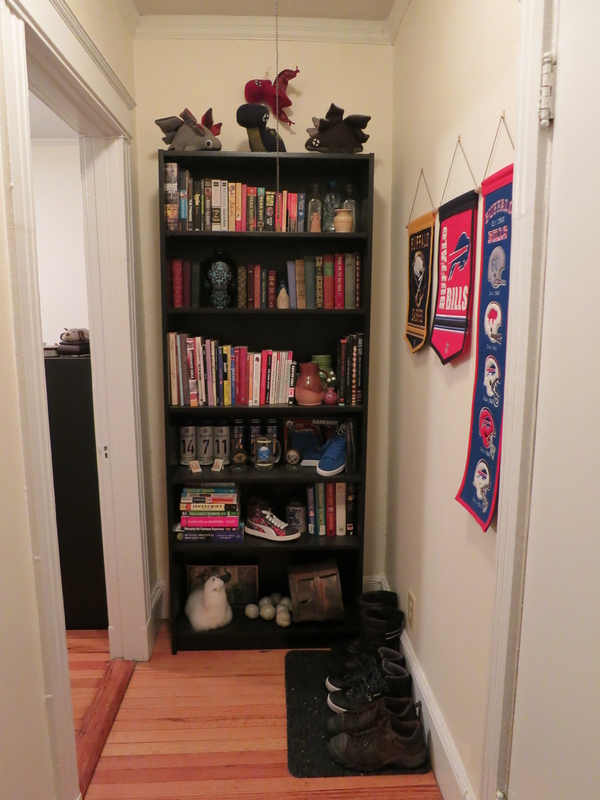 Perfect timing…we just got new Billy bookcases from IKEA and I’m working on arranging my hundreds of books! The problem with bookshelves is the same as the problem with bathrooms…you can’t control the pacakaging of the products you prefer. I love this post! My biggest dilemma is trying to organize a lot of textbooks with regular sized books. It looks very bottom heavy, any suggestions? I just recently got a huge new bookshelf to house my many many books so this is a very useful post, thank you! I love the idea of organising them by colour! I love the crate shelving design. Soooo much Navy Crockett office inspiration here! That deep teal colour is divine! Organizing books by color… can’t do that, sorry. I have my own filing system, and can’t find a book without it. Since I’m a writer and need references, I’ll keep my system. I also have a problem with stacking books horizontally, I’d rather use a nice tray or something horizontal to ground the decor. I’ve been thinking about new covers for my books. Maybe craft paper ? That way, I’d get a unified look, will protect my books and keep my organizing system. I plan on keeping a few beautiful ones coverless, and using them for adding pops of color. Any idea about a DIY for well-made book covers ? I’m sorry to say this, but many (if not most) of these shelves hardly deserve the lable *book*shelf. In my book the main feature about a bookshelf (pun fully intended) is … books. Some of the above presented shelves don’t hold a single book, in others, they are used to create oh so cute vignettes. While this is all nice and dandy, please, don’t call it a *book*shelf. Wonderful tips! I definitely need to style my bookshelves right now they are just cluttered with books and more books. I agree with german girl: a bookshelf needs lots of books or it is just a shelf. and I have to add: I would never ever organize my books by colour. Sorry, book shelves are for BOOKS. I agree w/ German Girl that some of these décor items are not *book* shelves. Drives me mad when decorators use books as objects, or put them on the shelf spine in, pages out, or slant them (weakens the spines), and stacked horizontally makes it hard to retrieve a desired volume at need. If people don’t like the way books look, tough. Don’t come to my house. I find a wall of books comforting and pleasant, and the books don’t need kitsch to “augment” them. I think when you are invited into someone’s home & you end up in the living room where the books are, I don’t think its rude at all to browse through the person’s collection of books after all they are on display . In fact I think that it helps you to get to know that person a little more, checking what sort of books they like and collect. These tips are not for book lovers, who do not have enough shelves for all the books they have. Arranging them by color is for people who have less than 50 books or people who don’t bother reading the books they have. Book shelves are meant for books, the sort you read, otherwise they are just decorative items. The only exceptions I make to that rule are allowing a space for a clip light to assist in reading said books and place to put my glasses if the shelf is near someplace I am likely to sleep. I agree with you. Finding the book you want to read is of major importance. I arrange by author. I would love to know the paint color used on your blue shelves. Cheers! I have quite a small unit that I’m just starting to style. The landlord will not allow me to nail anything to the wall. Any suggestions for bookshelves would be most welcome. Sorry about the landlord… must really sink ? You could try getting a shelf that touched the ground. Books by colour is an abomination (am being – slightly – over the top). What gets me, is that there are series where individual books are differently coloured – how can you place them in different areas merely by colour? It would reduce me to tears. Books with too horrible covers (or ones that dont match the contents) I cover in kraft paper. Books are the main thing on our shelves – they are an essential for life. Shelves that are mostly decoration are not book shelves, and books bought purely for appearance are being treated badly. I think organizing by color is actually a GREAT idea! Many of us have excellent color memory. I’m guessing it would be easy for me to find my books by color…probably even easier than by author. I did try the books-by-color thing and just about went nuts when I couldn’t find the ones I was looking for. Most of my books are reference and DIY so i use them a lot. I think if you have a small quantity or are the kind of person who never refers back to their books it may work. Otherwise, I think it could be interesting to color-code them with custom covers like Green for Gardening, Red for Reference, etc. Of course, that opens up a can of worms since that’s a lot of books to cover and one would have to recover each new book that is added. the technique is really wonderful. But I really do not believe every person can employ it. I totally get why people think ‘bookshelf styling’ and arranging by colour is for people who don’t love or read their books. I thought the same until I tried it. I have some books arranged by colour and it’s got me excited about my books and noticing ones I haven’t read in a while. Bigger bookcases are ‘styled’ and it’s made me excited about going to choose a book. I don’t agree with styling to the point where you can’t take the books out to read them, which really annoys me, but I do think it’s nice to create something pleasing and easy on the eye. I’ve put loads of bookends in so we can take books in and out easily and my bookshelves look so lovely and are full of things that speak about us. What’s not to like? I love the black and white image of the two bulls. Where is that artwork from? I think some of the people leaving comments need to read the book, “Daily meditations for calming your angry mind” :) To the author, thank you for your perspective and I found some great ideas. BTW, your pinterests link on the left is not working. TY. I think it is really cool that you looked into the different ways you could arrange the books by color. However, I don’t think this would be a great option for me and I would prefer to be boring and leave my books arranged by author. I also think it’s creative how you were able to use all different types of shelves and make them look amazing! Keep up the good work! I like all of your ideas a lot, but have a quick Q… When color coding, how can you still make it look good if you have books of different heights…?? I see how you did your bookshelf colorcoded(the home in DC) but, what if I only have 4 shelves and no divider, but still want to incorporate little objects in here and there…? Love this post. It’s very helpful and there’s lots of inspiration here. I’m not alone in thinking perusing someone’s bookshelves isn’t rude, right? !